Updated 1/30/12 Dunny went on holiday to Chernobyl, which turned out to be a bad idea. GID and semi-translucent, Meltdown Dunny is an 8 inch vinyl glowing ghost featuring dead eyes and what’s left of his pet fish. Follow these people on Twitter: @yoyamart @chrisryniak & @abelincolnjr because it’s Friday and they’re awesome! 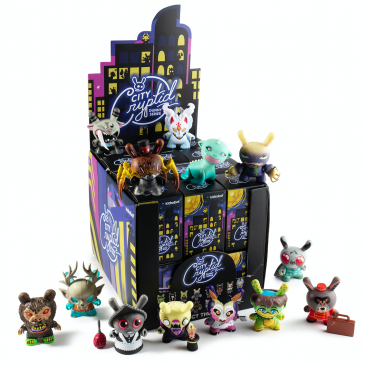 Chris Ryniak will be presenting his new solo show, This Could Get Ugly at myplasticheart this Friday, September 24. Artist, Chris Ryniak shares with us his new sculpts from the Lake Monsters at the Rotofugi booth. Chris Ryniak’s latest wonderful work of art is the Woodguard. 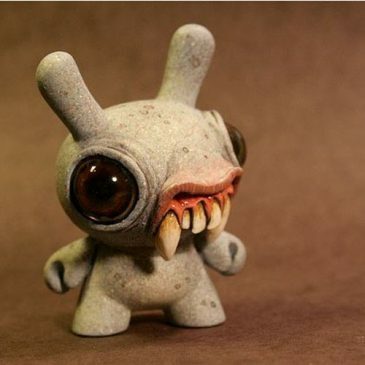 Chris Ryniak spawns a terrifying and awesome vampire Dunny.